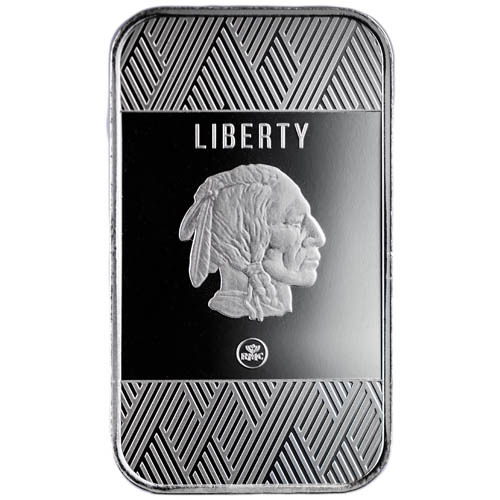 Any quantity only $1.19 per oz over spot! The Buffalo Nickel design from James Earle Fraser has been reimagined countless times since production of the five-cent piece halted at the US Mint in 1938. The Buffalo Nickel imagery is currently found on the US Mint’s Gold American Buffalo bullion coin collection and countless silver rounds. It’s never been captured quite like this before though. Today, the new 1 oz Silver RMC Buffalo Bar is available to you online at Silver.com. Bars ship to you in individual plastic flip or mint tubes of 20 bars, boxes of 100 and monster boxes of 500! First-ever issue of the Buffalo Nickel design on the RMC Silver Bar! Obverse features Fraser’s design of a Native American tribal member. Reverse includes Fraser’s depiction of Black Diamond, an American bison. Bars have alternating crisscross fields and deeply-mirrored, clear backgrounds. You’ve never seen the Buffalo Nickel design in the quite the same manner as it exists on this new Silver RMC Buffalo Bar. The obverse and reverse sides of the silver bar features Fraser’s designs from the Buffalo Nickel which was in circulation in the United States from 1913 to 1938. There are distinct design elements featured in these bars from RMC. The obverse side of the bar has the design feature set on a deeply-mirrored, clear background field with top and bottom border sections that use a crisscross pattern to reflect light differently from the bar. The reverse side has the opposite effect, with a crisscross pattern behind the bison design and the borders featuring the deeply-mirrored, clear background. All 1 oz Silver RMC Buffalo Bars available in this listing are available to you individually or in multiples of 20. Individual bars ship in protective packaging while multiples of 20 are available in tubes from Republic Metals Corporation. On the obverse of the 1 oz Silver RMC Buffalo Bar is Fraser’s depiction of a Native American tribal individual. His figure is featured in right-profile relief with two feathers woven into his hair that includes a braided section falling down over his right shoulder. The word “Liberty” is engraved above his head within the mirrored field and the RMC mint mark is featured below within the same field. The reverse side of the 1 oz RMC Buffalo Bar includes the image of a bison standing on a patch of dirt. 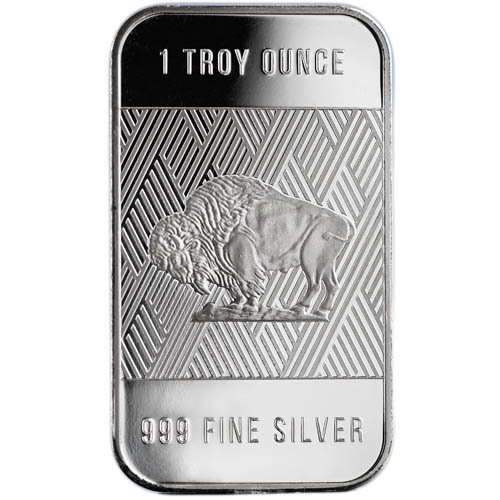 Captured in left-profile relief, this massive land mammal stands with its head down toward the ground and there are engravings of “1 Troy Ounce” and “999 Fine Silver” within the deeply-mirrored border areas. Please feel free to reach out to Silver.com with questions. You can contact our customer service team on the phone at 888-989-7223, chat with us live online, or simply send us an email with your inquiries.